Manuka honey an amber-colored honey bees make in New Zealand from the pollen of the manuka bush. Different kinds of honey--and manuka honey in particular-- have antibacterial properties and can become an alternative and natural form of healing. Rowena Jenkin of Britain's University of Wales Institute-Cardiff explains that manuka honey can be effective in treating serious illnesses including methicillin-resistant Staphylococcus aureus (MRSA) infections. Manuka honey can be used as a topical element of wound care or taken orally to gain its medicinal benefits. Apply manuka honey to a gauze bandage to help speed wound healing time. According to an August 1999 issue of the "Journal of the Royal Society of Medicine," manuka honey's antibacterial properties stem from the high sugar content of the honey. Summerglow Apiaries Ltd. suggests using 1 tbsp. of honey for a wound that measures 2 inches across. Place the honeyed bandage on a clean wound. If the ulcerated area is deep, you may need to insert some extra honey into the wound before affixing the bandage so that all the surfaces of the broken or infected skin are covered with manuka honey, according to the New Zealand Dermatological Society. Replace the old dressing with a fresh piece of gauze and more manuka honey once the wound begins to weep fluid. The frequency with which you change the bandages will depend on the severity of the wound. Consume manuka honey to treat common, minor medical complaints such as indigestion and sore throats. Summerglow Apiaries suggests taking 1 tbsp. 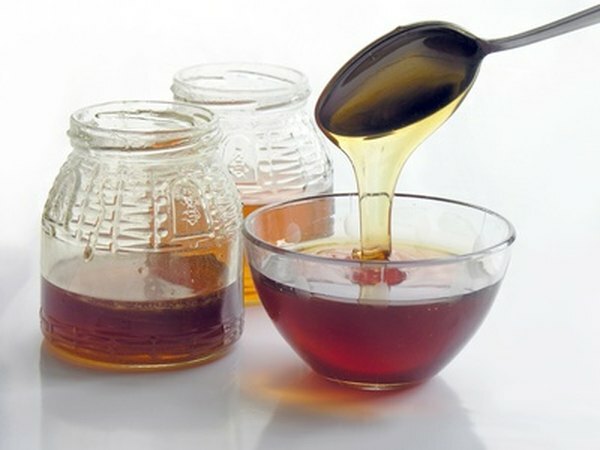 of the honey up to four times daily, as needed, to alleviate symptoms. Adjust your normal eating and drinking patterns according to the symptoms you are treating with manuka honey. If you are treating a sore throat, try not to eat or drink anything immediately following the manuka honey, to allow it to coat your throat. You can spread the honey on a piece of toast as a remedy for digestive symptoms. The honeyed bread will stay longer in your stomach than plain honey. Use manuka honey as a method to heal and relieve some of the pain of a painful condition called oral mucositis, in which your mouth's lining is plagued with ulcers. Oral mucositis is a common side effect of cancer treatments; the effectiveness of manuka honey for this condition is being studied by the British Columbia Cancer Agency. The treatment process for oral mucositis involved holding 1 tsp. of manuka honey in your mouth for 30 second before swallowing, to allow the antibacterial microbes to act on your mouth's lining. Repeat the treatment four times daily to determine the effectiveness.